Reading exposes children to a depth of language and vocabulary that gives them a huge academic advantage. I’d like to offer a list of ideas to help you make reading a natural part of your family’s life. Feel free to adjust or delete according to what suits you and yours. Our family has been through different seasons when it comes to library usage, including one in which taking my children there just didn’t work for me (because of their young ages). During that time I still used the library by going alone and choosing books for the kids. It became a special tradition, as they looked forward to the surprises in store upon my return. If you don’t have library access, think about what you can substitute instead. A book exchange with friends? Electronic books that you can download through a service like Overdrive.com? Making a wish list of books for relatives when they ask what to buy for holidays? Stocking up at garage sales? Do your best using what’s available to you in this moment. Bedtime isn’t the only acceptable reading time. I prefer mornings, when I have the most energy. Or you might try snack time with the kids around the table when they get home from school. For years now I’ve found our best time for reading aloud to be during a meal — when little mouths are busy chewing, giving me a captive audience. If you try and fail, don’t assume that reading aloud won’t work for you — just get creative with your timing. I realized several years into reading stories to the kids that Steve missed out on most of them since he was at work all day. So we began a family reading time after dinner, while everyone was still at the table. (Keep in mind that we tried this only after the kids were around age eight and had the attention span to keep up with us.) Our most successful readings as a family have been short — no more than ten or fifteen minutes, even if that means stopping in the middle of a chapter. Better to leave them wanting more than to have everyone give a sigh of relief when you’re done. For families with children under eight, reading a short Bible passage or story might work well at dinner. We love the Jesus Storybook Biblefor littles. For parents with work commutes, for lengthy road trips, and for the auditory learner when Mom’s or Dad’s voice starts to wear thin, audio books save the day. Download one for yourself when you’re folding the laundry or making dinner, or find a collection for the kids to choose from during afternoon quiet times. Discover new titles at audible.com, librivox.org, and your local library. If you have a child with dyslexia or a visual impairment, you may qualify for a subscription to LearningAlly.org. Our family has found it invaluable! At times I cannot even get through a paragraph of reading aloud without an interruption. A cup spill sends a child rushing to clean up, someone falls off their chair with a loud bang, or there are back-to-back questions about plot or vocabulary. It can make a well-intentioned parent throw in the towel. But don’t give up! Young kids’ interruptions may be merely logistical, but as children grow, their interruptions have more to offer — an insight someone noticed, a comparison to another book’s character, a deep meaning-of-life question. Don’t skip these, even though they slow the reading down! Indeed, one could argue that these interruptions are precisely why we read: to learn how to think, to have new ideas and observations. Find a method that works for you to handle these moments. I taught my kids to raise their hands when they have a comment or question and wait until I can pause to listen to them. It doesn’t work flawlessly, but it helps. 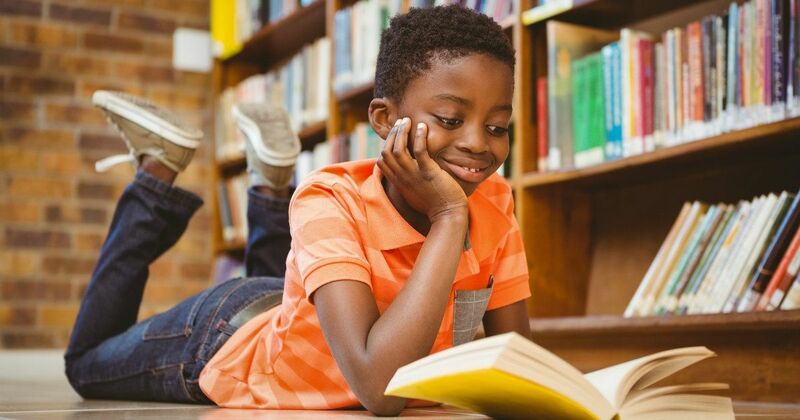 Excerpted with permission from Give Your Child the World: Raising Globally Minded Kids One Book at a Time by Jamie C. Martin, copyright Jamie C. Martin. Published by Zondervan. You can purchase here. Jamie C. Martin lives a global life at home every day with four countries (England, India, Liberia, and the USA) represented under her roof. She's blessed to be called Mommy by her biological son and her two internationally adopted children and loves sipping cups of tea with her British husband. Jamie blogs at www.simplehomeschool.net, where she's been writing since 2009 about mindful parenting, global mindset, education, and the joy found in a pile of books. She and her husband live with their three children in Connecticut.